This summer our Big Brother, The Orwell Foundation, is bringing George Orwell’s classic book Down and Out in Paris and London to life in an immersive performance that asks searching questions about homelessness today. Read on to find out how you can be involved! Orwell wrote Down and Out in Paris and London as a result of his own experiences sleeping rough and working on what would now be called zero-hours contracts in hotel kitchens. The performance draws on other pieces of writing by Orwell, including his diaries, The Spike and A Clergyman’s Daughter. And modern stories from the streets will be woven into the original text. Readers will include writers, activists, politicians, and young people who have been homeless. The performances will take place in London on 6th June as part of UCL’s Festival of Culture, and Paris in late September. 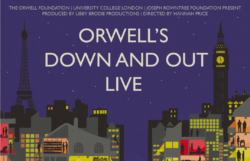 The event is the result of a collaboration between The Orwell Foundation, The Joseph Rowntree Foundation, Libby Brodie Productions and UCL’s Festival of Culture. It is supported using public funding by Arts Council England. The events will be accompanied by new poetic responses in English and French and a short film will be produced by the award-winning film-maker Edwin Mingard. Can’t attend the London venue? Both performances will be live streamed and viewing events will be arranged in libraries and community hubs across the UK, with both the London and Paris performances being recorded in full and being made publicly available. Ask your local library whether they are hosting a viewing! Or perhaps you’d like to host your own? Orwell believed that art and literature could make direct and long-lasting change, focusing his audience on the social or political evils of the day. The show will fuse live art and social activism in an outburst of theatre, music and literature: we’ll explore what homelessness is, how it manifests and what damage is does to the individual and to society at large. It might even inspire your Orwell Youth Prize entry next year. Libraries, bookshops, and community hubs can organise screenings. The performance will be live-streamed online. So, with the help of a computer, internet connection, and a screen or projector, members of the public can get involved in this nationwide event. On the day, it’s as easy as setting up a computer, a projector and some speakers, and clicking the link to get the live-stream started. Ask your local library whether they are hosting a viewing! Find out more about George Orwell, his writing, and his investigations into poverty. There’s a huge range of resources on The Orwell Foundation website – we’ve prepared a guide to how to get the most out of them. To publicise your event, we can help with posters, logos, information and some web support. We will add you to our listing of community events on our website, and can support via Twitter and Facebook (follow us on @TheOrwellPrize and use the hashtag). Watch again… George Orwell’s 1984: LIVE! 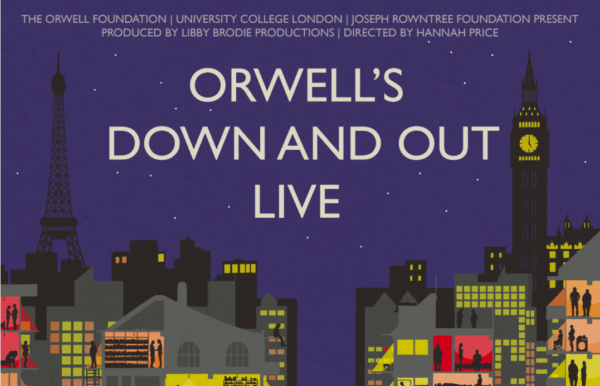 Last year The Orwell Foundation, in collaboration with UCL’s Festival of Culture and Libby Brodie Productions hosted the UK’s first ever live, unabridged reading of George Orwell’s classic dystopian novel 1984. You can watch the result – an immersive performance, featuring readers including George Orwell’s son Richard Blair, prominant writers and politicians – and the Youth Prize’s patron Rick Edwards – here and free to view on YouTube. All eight hours of it!